On Sunday, August 29, 2005, Hurricane Katrina slammed into the Gulf Coast and delivered a crushing blow to the city of New Orleans. As far as hurricanes go, Katrina was a beast. Katrina’s size, strength, and the angle at which she hit New Orleans combined to make her the storm the city had always feared. Only 24 hours earlier my wife, Karen, and I had packed up our four kids and evacuated with countless others. We drove 13 hours to my parents’ house in Virginia and watched the news with the rest of the country as Katrina made landfall. New Orleans had become our home in 2000 when I took a position as associate pastor at a Bible church in Metairie, the main suburb of New Orleans. We quickly fell in love with the city and the culture, but also learned that a part of our new life required that we pay attention to tropical storms and hurricanes in the Gulf of Mexico. Just a year before Katrina, the city evacuated for a hurricane, but the storm changed course. The city barely got rain, and everyone returned the next day. False alarm. But this time was different. Katrina was no false alarm. It would be close to a month before I would be able to return to New Orleans, and Karen and the kids would not return until Thanksgiving. People often ask if we were affected by Katrina. The fact is, everyone in New Orleans was affected. Whether it was your house, your office, your kids’ school, or your church, the water went everywhere, and no one was spared from its effects. When I returned to our home, there was still a little water in one part of our house. Mold was everywhere. Our church office had two feet of water. Files, books, computers… all lost. For those of us who lived there, time would now be forever marked by before Katrina and after Katrina. For me, the next two months were a mixture of repairing our home, doing ministry, missing my family, and longing for normalcy. In November I flew to Virginia to celebrate Thanksgiving with my family, and then the next day we drove home together to resume our life as best as we could. 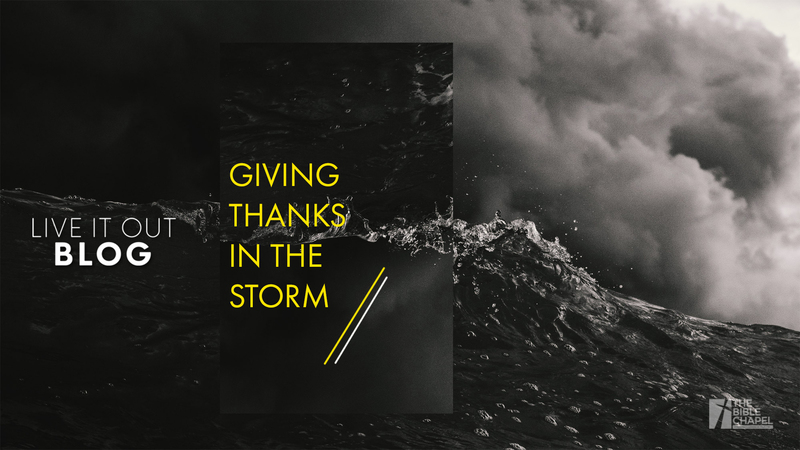 Let me share just a few lessons we took away from this chapter of our lives, and how Katrina helped us focus on what we were truly thankful for that Thanksgiving in 2005. A church family, is family. In the first days after Katrina, we honestly didn’t know if our church would still exist. We were unable to meet for three or four weeks as we recovered from the devastation. Enduring a tragedy like that is painful, but it can bring out the best in people. In the end, God did what God always does. He made things new out of what was broken. Thanksgiving has always been one of my favorite holidays. I enjoy the time with family around a great meal in a fun atmosphere. In 2005 we couldn’t enjoy Thanksgiving in the traditional way, but that’s ok; our hearts were still full of thanks. So this Thanksgiving, no matter where you are, or what your circumstances may be, remember to thank God for the things in this life that matter most. After all, there’s no room for bitterness in a heart that is full of gratitude.